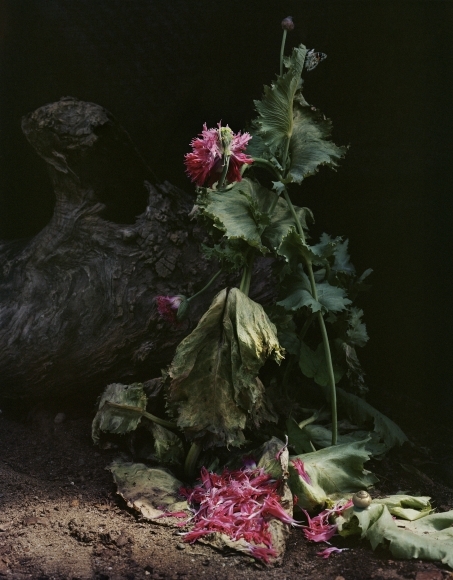 "Sharon Core’s carefully constructed images examine the relationship between illusion and reality within photography. 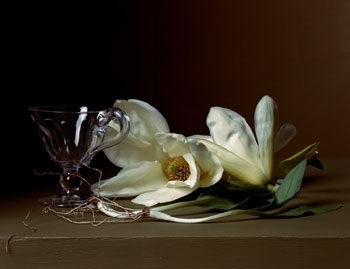 From Early American (2007-2010), painstaking photographic recreations of the still lifes of 19th century American painter Raphaelle Peale, to her most recent series, Understory (2014-2016), inspired by the work of 17th century Dutch painter Otto Marseus van Schriek, for which she cultivated and photographed a rich array of plant life, Core problematizes our understanding of photography as a simple truth-telling medium. In Early American the viewer is presented with still lifes of an assortment of objects, including flowers, fish, fruit, and antique crockery. Core replicated Peale’s use of lighting, subject matter, and composition, even growing from heirloom seeds varieties of fruits and vegetables in existence in the early 19th century. Through these efforts, Core attempts to mirror Peal’s meticulous painting process, while simultaneously acknowledging the temporal, contextual and technological rifts between the photographs and their reference materials. Similarly, for Understory, Core maintains her commitment to authenticity in the materials she photographs, creating a living studio from a large geodesic dome in which she grew the plant life featured in the photographs. Thus, her work is not entirely fictional, but can be seen instead as an extension of reality, in which the lines between the natural and artificial are blurred." Early American Series (Left to Right), Strawberries and Ostrich Egg, 2007, 17 x 23 inch, chromogenic print, Apples in a Porcelain Basket, 2007, 15 x 18 inch, chromogenic print,Magnolia with Wild Leeks, 2008, 14 x 17 inch, chromogenic print, Sharon Core. Understory Series (left to right), Untitled #1, 2014 Archival pigment print 34 x 30 inches, Untitled #7, 2015 Archival pigment print 18 x 14 inches, Untitled #8, 2015 Archival pigment print 40 x 26 inches, Sharon Core.